Handwriting is paramount to develop early childhood cognition. It primes students to learn to read more quickly and positions them for creativity and information retention. According to a New York Times article, What's Lost as Handwriting Fades - new evidence suggests that the links between handwriting and broader educational development run deep. The article goes on to site a 2012 study led by Karin James describing the increase of brain activity present with children who were able to draw duplicate shapes by freehand. The same brain activity is present in children engaging their motor pathways which is clear evidence of the benefits of teaching handwriting. Although we are seeing a rise in the importance of teaching handwriting, and this is applauded, attention to correctly teach letter formation is often missed. In many cases, educators teach students to start and end letter formations specifically on one of the guiding lines, including letters that begin with a circular motion. This practice potentially delays learning progress and restricts mastering manuscript handwriting. 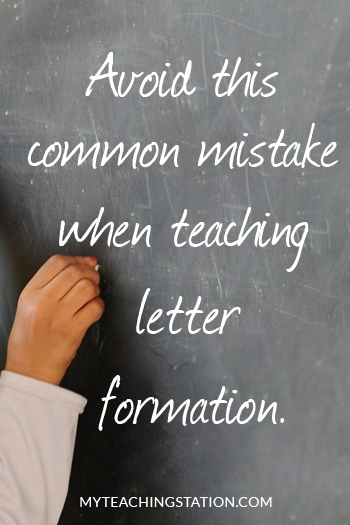 Teaching and reviewing proper letter formation creates good habits for beginners and reinforces proper letter formation for children already on their way. Of course, the pace at which you introduce letter formations varies based on the child's learning capacity and development, however starting with correct formation from the beginning avoids establishing inefficient handwriting habits. This is of great importance as muscle memories are difficult to unlearn later in the developmental process and require your child to use valuable mental resources for corrections instead of progress. So let's jump in here and look at the correct starting position for the formation of the letter a. Notice how letters that begin with a circular motion start from slightly under the middle line as shown here. By emphasizing the proper starting point of these letters, students avoid developing poor letter formation habits. The following handwriting is a typical example of students incorrectly taught to start on the line for the letters that begin with a circular motion. 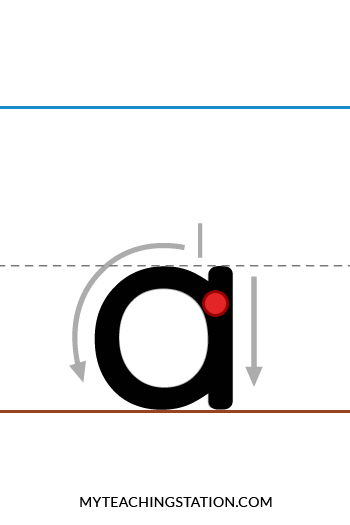 Notice how the student must navigate around the circular formation of the letter a to avoid cutting through it. Also, this starting point is not consistent with the proper position for the letters c, d, g, o, q, and s.
These micro adjustments of teaching correct letter formation set your student up for long term efficiency and developmental progress. Additionally, when students learn the correct starting points and progression of letter formations, the transition to cursive writing comes with less effort. I was once asked, "When is the best time to plant an Oak Tree?" The proper response, "Twenty years ago. The second best time...today." From every angle, teaching correct formation and technique from the start is always best, however, it is never too late to begin. What has your experience been like when teaching letter formation? What struggles have you seen in your students? Have you seen these problems before? Debunking the Talent Myth. Ignite Your Child’s Potential.